Breakfast is the most important meal of the day. Isn’t that what Mom always said? 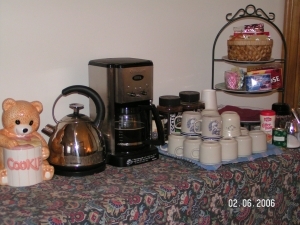 At the White House you will awaken to the aroma of fresh brewed coffee and home baked goods. When comparing nightly room rates around town, be sure to factor in the cost of coffee and breakfast. Some places do not offer any breakfast, others don’t put as much effort into their buffets. Other places you can get bacon, eggs and the works. Be sure to ask. Our generous self-serve breakfast buffet is available in the dining room every morning from 7:00 am to 9:00 am. Coffee is on earlier. 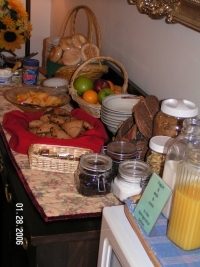 The buffet typically includes fresh fruit, canned fruit, bagels, cereal, yogurt, hard boiled eggs, oatmeal, juice, coffee and during the summer months . . . fresh baked goods. If you have allergies or specific dietary needs, you are welcome to bring your own products to the breakfast table and there is a refrigerator in each room. We have a microwave and toaster in the dining room available for guest use at any time. As well, a tea kettle in the parlor for tea or cocoa. 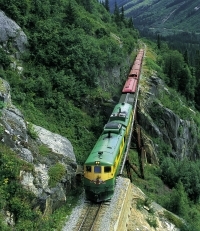 For those that are departing earlier than 7:00 am, we can prepare a breakfast to go for you. Just let us know before 5:00 pm the day prior.